An unfinished basement can save homebuyers money because it costs less than a finished space. Do-it-yourselfers can then slowly make the space livable when budgets allow by completing partial remodels until the basement is complete. The cost for partial refinishing depends on the task and whether the homeowner or a contractor does it. Prices are as of 2011 and from DIYorNot.com. Homeowners can frame walls, add insulation and install wallboards to quickly and inexpensively turn a cold basement into a livable space. Do-it-yourselfers can do this in about 32 hours for the cost of materials, which typically run $470 for a 20-by-30-foot space. The tools needed include a saw, a carpenter’s square, a level, scissors, staplers and screw guns. Hiring a carpenter means that the job will be finished in 25 hours and is done more professionally but it costs about $1,559. Though a basement with finished walls may be livable, the clutter of ductwork, pipe and wire near the ceiling may prove an unwelcome distraction. 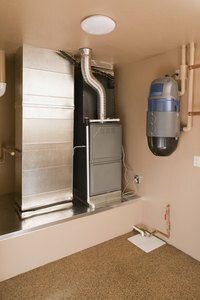 During the winter, the area can also trap heat that should be circulating into the living space. A suspended ceiling covers the mess with acoustic tiles on a metal grid. Handy homeowners can cover a 300-square-foot space in 24 hours for about $650. Contractors charge $1,113 but can complete the job in 17 hours. Costs rise if the installation incorporates lighting. One of the more convenient ways to finish a basement floor is to install carpet tiles, which can easily be replaced if they are damaged. They range in size from 12 to 22 inches and lock together. Do-it-yourselfers can complete 180 square feet in about six hours at a cost of $890. Professionals charge $1,071 and complete the job in five hours. Wall-to-wall carpeting involves more effort but offers a more finished look. Homeowners can complete the job in nine hours for $500 in the same-sized room with good quality nylon carpeting and padding. Pros take about four hours and cost $740. The cost of using professionals varies because their wages depend on their location in the country. For example, the Bureau of Labor Statistics puts the wages of carpenters, as of May 2010, at a mean $21.10 throughout the United States, with a low of $11.85 and a high of $34.45. Hiring one in Hawaii and Alaska costs the most money because wages there run a mean $31.81 and $29.14 per hour, respectively. These are the highest-paying states for the profession. Rates drop in South Dakota, where wages are a mean $14.81 per hour, and Texas, where the pay is a mean $15.59 per hour.